Click here to download your free picture strip! Captain Integrity is an educational resource that can be licensed to brand your health care organization's compliance program. With Captain Integrity as part of your compliance team, your physicians and employees will receive necessary compliance education by using lighthearted picture strips. 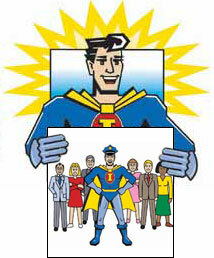 Each Year Captain Integrity appears in person at the HCCA Annual Compliance Institute Conference. For those of you we met at the conference, please click on the link below to see and download your 2019 HCCA Conference pictures with Captain Integrity. If we missed you, please browse our website to learn more on how Captain Integrity can make compliance education fun for your organization !